What is the origin of the tiger balm? Home / What is the origin of the tiger balm? The tiger balm has its root of origin in china. In ancient Days, the chinese emperors ordered their chemists to provide best remedies for their pains and they made tiger balm for their emperors. In the end of nineteenth century, a Chinese chemist named Aw chu Kin who hailed from Rangoon in Burma, did a profound research to find the best way for curing various body pains and ailments. He made a study on various remedial measures which was used by the chemists of ancient Chinese emperors. Aw chu Kin’s scrutiny on remedial measures made him to discover that tiger balm is a mixture of diverse active substances such as camphor, menthol and cloves in a correct proportion. We all should thank his two sons Aw Boon Par and Aw Boon Haw (Haw=tiger) for realizing the value of their father’s invention. They had an important role in the transformation of this formula which existed just in paper into a fabulous ointment and made it available all over the world by reintroducing it with a brand name “Tiger Balm”. The reputation of tiger balm and its derivatives is well established they are universally known and recognized for their analgesic effects. For external use only, to counter the irritation, promote blood flow, muscle aches. 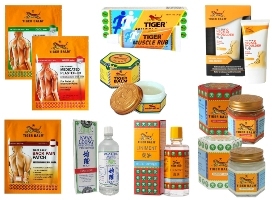 Tiger balm is made from the active substances such as camphor, menthol, oil of cajeput and clove oil. Tiger balm is applied with gentle massage on muscle aches, stiff neck, insect bites, on the temples to fight against headaches or help with relaxation ... Tiger balm dilates blood vessels allowing a better flow of blood that is an effective remedy for relieving migraine. Tiger balm is an ointment used to relieve muscle pain associated with overexertion, backache, arthritis and any musculoskeletal problem. By improving the flow of energy and blood, the Tiger Balm allows muscles to relax, and reduces inflammation of joints and tendons. Thus it relieves pain and helps the healing process.